Try the city's official cocktail at the Roosevelt Hotel. Hot new venues and classic bites. 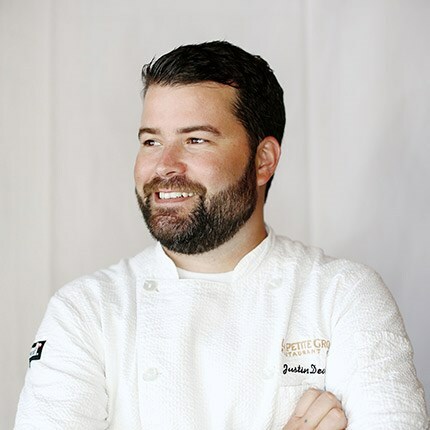 Chef Justin Devillier of La Petite Grocery. Blue crab beignets at La Petite Grocery. Hers is sage advice, not just at traditional staples such as Dooky Chase’s and Commander’s Palace, but for the city’s hottest new venues, where forward-looking chefs are putting a creative spin on the city’s classic bites. Here are just a few of our favorite reinvented dishes to order now. Hot-from-the-oven beignets, loaded with a heavy dose of powdered sugar and paired with chicory-scented café au lait, have been New Orleans’ breakfast of choice since Café du Monde opened in the French Quarter in 1862. At La Petite Grocery (4238 Magazine Street), Justin Devillier, former Top Chef contestant and this year’s James Beard Award winner for Best Chef: South, takes the city’s beloved staple savory by stuffing it with fresh blue crab meat. Housed in a century-old cottage that was once a grocery, his Uptown venue is now a refined dining spot “on the top of everyone’s list,” says Miller Murphy. Dip La Petite’s crispy beignets into a tangy dollop of malt vinegar aioli and you’ll soon understand why. Best New Restaurant. A tall, wood-fired oven stands like an altar in the corner of the dining room, creating some of the lightest, freshest pita bread you’ll ever taste. By all means, dip a piece into Shaya’s creamy hummus or use it to snag a piece of curried fried cauliflower. Then get ready to dive into one of New Orleans’ most sublime entrees: pan-seared red snapper on a bed of jasmine rice spiced with a mix of tomatoes, paprika, garlic, and cayenne – known as chraime sauce. Local legend Emeril Lagasse is well known for his red snapper in Creole sauce, but Shaya’s seasoning adds a whole new dimension to the dish. A cornerstone of the city’s emerging Warehouse District, Cochon (930 Tchoupitoulas Street) recently expanded to accommodate its growing legion of loyal fans. Chef Donald Link is a Louisiana native inspired by his grandparents’ Cajun cooking, so it comes as no surprise that gumbo is always on Cochon’s menu. Link uses a traditional roux in his zesty base, but his creativity can be found in his main ingredients, chunks of turkey mixed with black-eyed peas and kale, or shrimp with spicy deviled eggs – items you certainly wouldn’t find in a bowl from the eighteenth century, when the stew originated. On the edge of the French Quarter and not far from Frenchmen Street, Coop’s Place (1109 Decatur Street) is best enjoyed after catching a set of smoking-hot live music at nearby d.b.a. or The Spotted Cat, especially because the kitchen is open late. Its signature dish is rabbit and sausage jambalaya, much tastier than the more typical chicken version. Order it “supreme” and they’ll add large shrimp, crawfish tails, and chunks of tasso, seasoned ham that’s smoked in their own courtyard. Virtuoso advisor Stephanie Miller Murphy also suggests trying these venues that helped define the city. 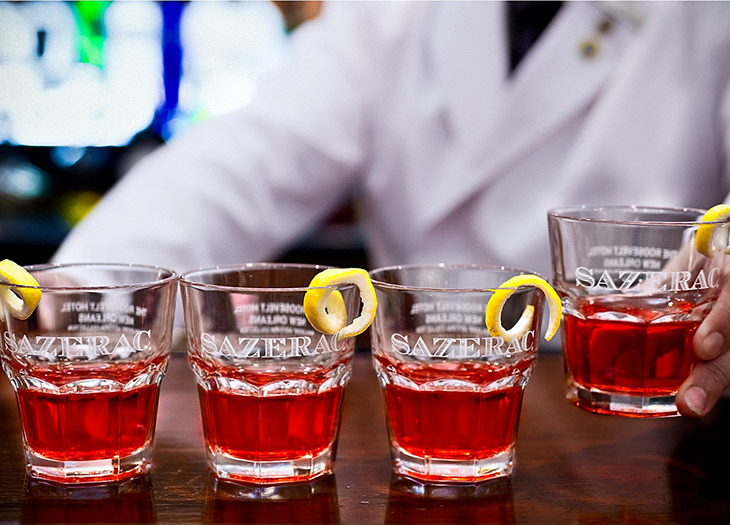 the Sazerac – since 2008, the city’s official cocktail – which was originally served with cognac before bartenders switched to six-year-old rye whiskey in the 1870s. Try either variation, stirred with Peychaud’s bitters, poured into a glass coated with Herbsaint liquor and garnished with lemon peel, at the Sazerac Bar inside the historic Roosevelt Hotel. While the rye cocktail is smoother, the cognac is richer and better suited for an after-dinner tipple. The Ritz-Carlton, New Orleans, a 527-room hotel set in a 1908 Beaux-Arts building on the edge of the French Quarter, features an open-air courtyard, nightly live jazz in its Davenport Lounge, and Club Level rooms that offer morning mimosas and treats throughout the day. On your to-do list at the 504-room Roosevelt New Orleans: Lounge at the rooftop pool, grab a Sazerac at the bar, head to The Blue Room to see where Louis Armstrong once played, and take a short stroll to the restaurants in the French Quarter. Your advisor can work directly with Virtuoso’s local tour provider, Royal Insider, to craft a customized New Orleans trip that includes, say, touring a farmers’ market and taking a private cooking class with one of the city’s top chefs. Originally appeared in the October 2016 issue of Virtuoso Traveler.